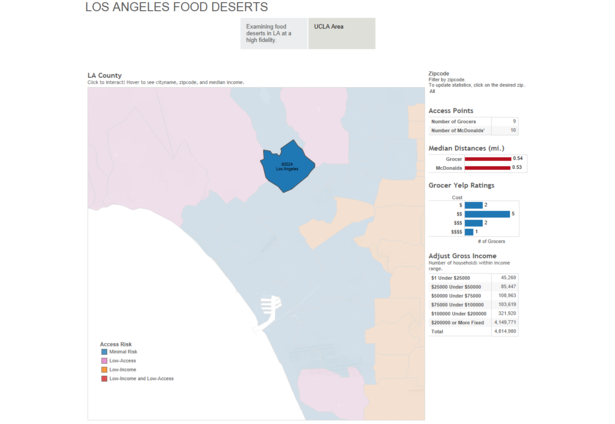 Los Angeles - Where are the Food Deserts? Finding the places lacking healthy food options! When I worked in South LA, it seemed like there were no grocery stores nearby. Sure, there were plenty of fast food places around but when I wanted buy groceries to leave at my desk for the work week, it seemed like I had look far and wide. Why was it so hard to find a grocery store for food but a McDonald's was right around the corner? I was beginning to believe I worked in the middle of a food desert. A food desert is a geographic area where residents lack access to healthy food options. Lack of access could be a product of many things: distance, convenience, or low-income. All these things affect a resident's ability to acquire healthy food options. I looked on USDA's Food Access Research Atlas to see if I lived in a food desert. To my surprise, the area where I worked was not a food desert! A grocer may have been within a mile away but it felt so inconvenient when all these other food options were so common. There was a fast casual bakery/cafe place known for having healthy sandwiches. But they were pretty pricey, not really fiscally efficient to eat there often. So I was experiencing a lack of access and I didn't even live in the area! I just worked there! This inspired me to make the software you see here. 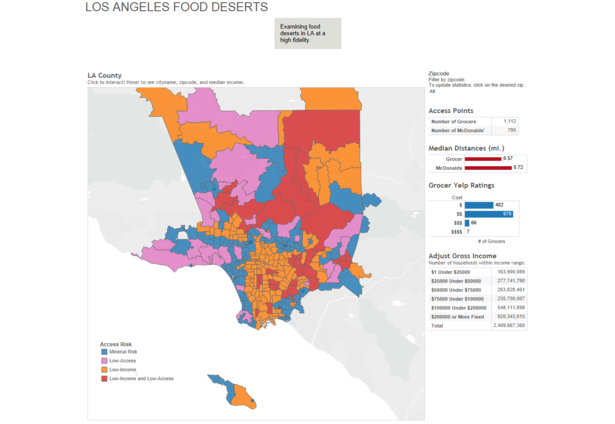 I'm proud to provide a visualization of food deserts that captures more of the factors that define the issue. Lack of access is a multi-faceted problem; it's more than just the distance to a grocery store. Poverty and income come to play. Do the grocery stores provide an economically viable means of food to residents? The USDA used a population-weighted centroid to compare distances of census tracts to grocery stores. I was able to find a dataset for Los Angeles that provided all residential zones. So distances are calculated from the residences themselves! The density of grocery stores vs. other food options are important. Especially in urban areas where distances are much shorter than rural areas, fast food places could be an easy choice just by sheer abundance. McDonald's is only used as a metric to quantify convenience. McDonald's is not the cause of food deserts. It makes a great metric because they are affordable and very commonplace. The Yelp ratings should also help identify if it's an affordable option to grocers. What would make sense is seeing more upscale grocers near higher income areas. If there were upscale grocers near poorer areas, it would unlikely that the residents can afford it. And if they can't afford it, they are more likely to get their food elsewhere. The income distribution is to give a viewer a better summary of the social-economics of the area. With the Yelp Grocer Ratings and socioeconomic distribution included in the data set, I hope to provide a higher fidelity to the food desert issue in Los Angeles in addition to the distances and abundance of grocers. My dataset can be useful to politicians resolving the issue of food deserts. Los Angeles dictates incentives for grocers to open their doors in South LA [link]. This visualization can help them determine more specifically more regions that greatly benefit from having a local grocer. The grocery stores themselves can determine whether their branch is best suited price-wise to open in a region. Public health advocates can use it to identify locations that will greatly benefit from educational actions for health awareness. Distance to a grocer is not a good indicator of poor access. 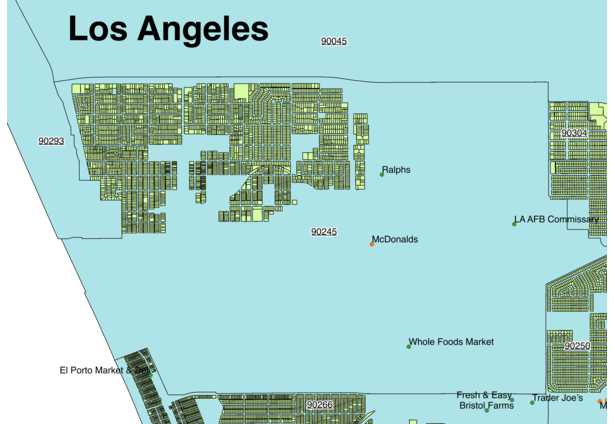 By examining a zipcode like Malibu 90265, you can see that the median distance to a grocer is ~2.5 miles. And 50% of residents drive further than that! However, the medium income for the area is $200,000 or more! Those with more disposable income can have spend more on the trip to buy food. So food deserts should be identified with more than one metric. At the very least, it should be based on income and distance to a grocery store. So let's examine, zipcode 90810, an area within Long Beach. It is identified as a low-income and low-access area. There are 3 grocers and if the median distance is a mile, 2 grocers are within a mile! All the while, there are 2 McDonalds' that are within half a mile! Looking at the Yelp rating, there only one rating and it's two dollar signs ('$$')! Surely, a low-income area would benefit from a grocer that is consider a little more affordable (one dollar sign '$'). The Long Beach area above can seen to have both ends of the income spectrum. It's possible, like in zipcode 90059, to have nobody earning over $200,000 in the area. So you can imagine that there could be areas with nice neighborhoods in Long Beach. Perhaps those neighborhoods are closer to the 2-dollar sign grocer. I hope that this provides a higher fidelity to the issue but I don't claim this will solve it. It should be used as a tool to identify the areas and then those who can investigate at the ground level, politicians and health advocates, can determine what solutions would best apply to that case. Comments for this submission are closed. View the software in nbui's portfolio to continue the conversation.